So here we are, March 2018, 1 year on from when Burnsyde Beach House was open to our first guests. 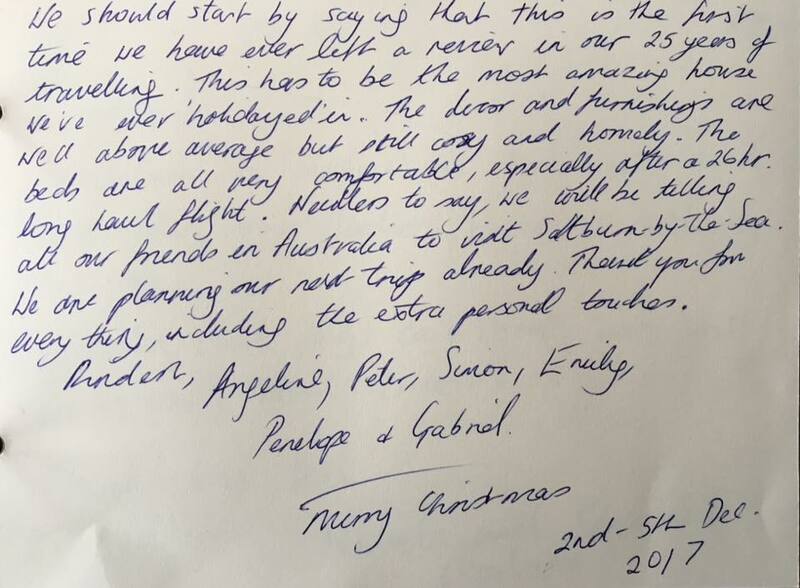 It seems like just yesterday when we think about our nerves and our excitement, but seems a lifetime ago when we think about all the wonderful guests we have had stay with us, the amount of reviews we have collected and generally the amazing reaction we have had to the bungalow on the bank. It was March 10th 2017 when we welcomed our first guests, a bunch of creative guys from Germany working in Darlington on a filming project. Since then we've had couples and families from all over the UK and welcomed guests from Canada, USA, South Africa, Argentina and Australia. Our little Beach House has been helping to put Saltburn by-the-sea on the map and we couldn't be happier that people from all over the world are enjoying their stay and our little town. With 114 bookings, 473 guests and 74 dogs so far we've had relaxing family getaways, birthday parties, anniversary celebrations, girls weekends and school friends catching up after quite some time, with each of them comes a review that we can be proud of. With memories such as baby's first crawl and a proposal the beach house can be part of peoples memories for a lifetime. This year is looking good for Burnsyde with both new and returning guests, Summer is full with just a few gaps in for Autumn and Winter so if you are wanting to squeeze in then take a look at our availability calendar here. We really hope that our guests continue to share their love for the Beach House with their families and friends and we can continue to welcome people from all over the world. Thank you to every single person that has stayed with us, posted a review, told a friend about us, shared our Facebook posts, entered our competitions and generally supported us, we appreciate it all and wouldn't be sharing this post if it wasn't for each of you. We are probably super biased when it comes to the town of Saltburn and everything in it as we are from the town BUT I am sure lots of people would agree (out of towners too) the town is a wonderful little place with lots of special treasures to be found. We thought we would share with you a few of our favourite places to go at the moment! Whether you are looking for tea and cake, a tasty cocktail or a little taste of Italy we have just the place for it! So first up – Coffee and Cake! We have chosen somewhere literally a stone’s throw from the bungalow! Camfields Espresso Bar! A lovely little beachside spot serving delicious illy coffee and super tasty cakes and treats! Camfields has a couple of seating areas outside and one inside. You can relax and watch the world go by with your well behaved pups at the front of the bar or take a spot on the deck at the back of the property (a total sun trap)! For those chillier days there are tables inside, surrounded by glass so you can still enjoy the stunning Saltburn views! Camfields is fully licensed too so if you are stopping by after a day on the beach you can enjoy a cold beer before your onwards journey (hopefully up the steps to the Beach House)! Although our town is relatively small there are some super places to grab a cocktail from. We have tried them all and as we can’t quite decide which is our absolute favourite we will share two with you. This is a sweet little Tea & Liquor bar tucked away under the arches in Saltburn Square. A quaint and cosy vintage styled teashop and cocktail bar perfect for an evening of girly chats, family get togethers’ or romantic date nights! They really do cater for everyone. Another popular spot for us is Rapps Café on Milton Street! A busy little Café and Wine Bar just a short walk from the Beach House. Their Mojito is the perfect way to start your evening and an absolute favourite (of mine) in here is their Espresso martini, I don’t know how they do it but they are just sooooo tasty! Perfect end to an evening if you have just stuffed your face with one of their pizzas! Saltburn has a wonderful, family run Italian restaurant bang in the centre of the town - Alessis! They have all kinds of scrumptious pizzas and pastas for all the family! They also do an exceptional (although not Italian) Chicken Paremsan! That’s right! The legendary Parmo is available at Allessis! We can definitely recommend! The whole team at the restaurant are so welcoming and super friendly, you can’t help wanting to visit again and again! Definitely our number one spot for a taste of Italy! You can catch Happy hour on Monday - Friday from 4pm - 7pm and on Saturday from 4pm - 6:30pm! Whether you are staying at Burnsyde or not, Saltburn is definitely worth a visit just for these super duper places! All the Befores and All the Afters! Tomorrow our first guests arrive! For one whole week they will get to stay in the bungalow on the bank and enjoy what we have been working on for four months! The hallway looked quite dark when we began, although there were features we loved about the space we had to strip everything out to start again. The result, a bright white welcoming space! We found this space a bit of a challenge due to its shape and not wanting to make one end of the room feel separate to another. The staircase was moved into this room from one of the bedrooms and we managed to arrange our new furniture to keep the room 'as one'. A transformation indeed. From the blue and green pattern with glass details to an open plan room with an archway allowing bundles of light in! This is one of our favourite parts of the property! From fitted bath to roll top and radiator to towel rail! This room was a shell just a number of weeks ago! After a long walk on the beach relax with a glass of wine in this calming space. All that was left were floor boards and bare brick! Now - natural coloured spaces with simple furniture. Suitable for adults and little ones alike. We have opened this space right up and added a little en-suite into the mix. Now you can shut the door and enjoy some peace and quiet while the sun shines in! The perfect place to watch the world go by and get lost in the waves crashing against the cliff! Sit back and relax with your morning coffee, with a view like no other! The blue bungalow is no longer blue...We really hope you like what we have done to the place! 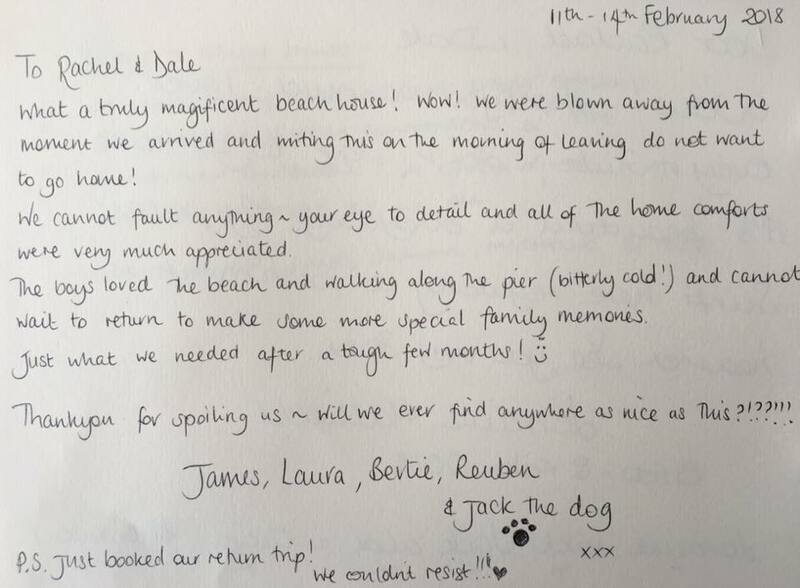 Since the beginning of February we thought it would be closer to the end of March that we would be welcoming our first guests but since we uploaded the pictures of inside the Beach House our calendar is filling up and guests are booking in earlier and earlier. I can’t explain the excitement when we receive a new message from someone requesting information on the beach house or the town. I guess it brings a mix of emotions really…Happiness because what we have created what has been so well received and relief because it gives us hope that this little beach house by the sea might just work. For the past week we have been busy trying to get lots of little things signed off with different agents and meeting various regulations for health and safety etc. We have also been working on our advertising and marketing! Our competition has brought more attention to our Facebook page and website than we could ever have imagined, the blog has seen some great traffic and now we just need to spread the word of Burnsyde far and wide. Head over to our Facebook page to enter our competition if you haven't already! This weekend we are heading down to the beach house to finish off the interiors in the sunroom. This is the last room to be finished and hopefully by Saturday we will ready for the doors to open. This Saturday is our definite deadline, we are having a little thank you get together with the team who have helped us get to where we are and although they have seen inside it more than we have we want them to be in our company in its final state so that we can all celebrate together! Anyway, next week I will be back with more interior pics and I may even let you in on who our amazing team actually are! T Minus 4 weeks until we have our first guests stay! The garden had always been well looked after by John but the paths and steps were just a little unsafe so we knew they needed an update. With new steps and a freshly painted doorway we think the place looks much better! The inside of the house has been having a few more details added...A handmade coffee table in the living room. It's amazing what I can do with a few scaffold boards and some hairpin legs! This was something we saw months ago, right at the beginning of the journey, we searched high and low to find something similar ready-made but we really struggled. They are only little touches but they make a real difference to the rooms they are in and we just love that they have been made especially for the Beach House. This weekend will be the first in a while that neither of us will be travelling down to the Beach House, I am on a hen weekend and Dale has to work. Next week will be the final weekend we see it before we welcome our first guests. From now until then we will be working on our marketing and advertising to get our wonderful little beach house full up for 2017! Sneak Peek - Interiors Alert! Interiors have been unleashed! After another busy week for the team and a huge helping hand from Di (Dale's mum) the bungalow was ready to have some furniture put in place. When we left the beach house last week the van had been unloaded but that was basically it. This weekend it was time to start organising. Although it feels like we haven't stopped buying furniture and interiors for quite some time there is still lots of little details that need adding to make the place complete! There are some major pieces missing like the dining table and bench, bathroom unit and coffee table. These are all being made bespoke and due to Dale and I being rather particular (fussy in the minds of the makers) they have taken slightly longer than expected. We are certain they will be more than worth the wait though! Although we are biased we definitely think we have a beautiful little place here. That said, we would love to hear what you think of the new layout, design and style! Please leave us a comment or drop us a message or email! All feedback is welcomed.......except that we need some curtains...we know that! They are in the making! I keep saying it but....we are nearly there!! We arrived at the Beach House on Saturday morning with so much excitement to see where we were up to and we were not disappointed! SS has gone above and beyond with the team to have this place ready for Dale and I coming back to see it. Their endless hours of work have created something really beautiful and we will be forever grateful! The team have excelled themselves! Every room looks amazing, each feature has been completed with TLC and the bungalow looks more amazing than we could have ever imagined. If you saw it yourself you may think "well it's just a bungalow that's been re-decorated" but we know exactly what it has taken to get to this stage and it is so much more than a lick of paint. We were staying in Saltburn for a few more days so we could help with anything that still needed doing and get the furniture inside. Dale had lots of meetings for the Beach House and property business and I rolled up my sleeves and spent lots of my time at Burnsyde, tidying and cleaning. Dales mum was there to help me and my mum was busy adjusting our new curtains, Grandad Clive and SS were building a new wall and steps at the front door , Andy was busy tidying up lots of little loose ends and Trevor was finishing up with the glossing - we had help from all angles. It really feels that time just disappears when we walk into the bungalow, I don't know whether it's because I spend so much time admiring it that I don't notice time passing or because small jobs take much longer than you think! Either way the days were flying by and by Tuesday we still had lots to do before unloading our van of furniture! Between the work I managed to spend some time with my bezzie and our poochies on the beach, no matter what is going on a walk along the beautiful shore makes me smile! So enough of the chatting....here are some sneak peek pics of how Burnsyde is looking now - These pictures really don't do it justice and I don't want to give too much away so this is your lot! So here we are....February 1st 2017! One month away from opening our doors to guests. Exxcciiiiiiiiiiiiiiiting! We celebrated Dales birthday on Friday and we were talking about where we might be and what we might be doing when his birthday comes around next year! We never expected to have Burnsyde a year ago and look at us now......a few weeks from doors opening! So over the past couple of weeks the renovations have been coming to an end. There have still been a number of things to look at and complete but the place is definitely getting there! SS is continuing to keep the team in order and hit the deadlines - if you are ever looking for a project manager, SS is your man! The flooring is almost finished throughout, the sunroom has been re-boarded and is getting plastered this weekend then it will be ready for a lick of paint! The flooring in the dining area is finished and the radiator is back up and running, ready to pump some heat into the place! We were so worried about the beach house being chilly in the winter months but after all the new insulation, re-boarding and plastering it keeps the heat in just wonderfully! Our handyman has been in this week making and fitting new door frames and hanging the new doors. We have chosen a four panel oak....just need a door nob now! Dale and I have not been back to Saltburn for a few weeks, Saturday we will be there to see the place (almost) complete and ready for for furniture! We will be driving down in a big white van, or Dale will - I will be in the car with little Derek! We are spending 5 days in Saltburn to help the team finish up on the little jobs that are left and get the place looking a little more livable! We are so excited that we are at this point in the journey! Our first guests will be there in no time! We have an engagement party on Saturday for our wonderful friends Rob and Nicky then the rest of the time will be spent in Burnsyde or in meetings about Burnsyde and catching up with family and friends. The past few months have been so busy each time we have been back we feel like we don't spend any time with the people we love, half the time Dale and I barely see each other! This week there has been a development with our own life too....It has been Derek's first day at doggy nursery! It was an emotional morning for me, I am not sure it's the exact same feeling as the first day you drop your child off at nursery but it was certainly a weird one! He was away from us for 11 hours (his longest time away from us) and I have never seen him as excited as he was when I collected him. He is such a wonderful little dog with tonnes of character! We love him so, so much! If all goes to plan in the next few days we will have interior images to share with you on our next blog post! Fingers crossed! So we are heading towards the end of January and in 1 month the beach House should (WILL) be 100% complete - interiors and everything- Ready to hire! We have had lots of interest in the Beach House since the last post went live showing our rates and answering a few questions. We had worried people wouldn't want to enquire until they could see lots of images inside the property but we were obviously worrying a little too much, we have had some really great feedback about the property already and look forward to welcoming all our guests! The flooring is finished in the living room, hallway, downstairs bedrooms, bathroom, en-suite and dining area! It has really brought a lovely flow to the property and in a week or so the remainder will be complete and we will be able to start thinking about getting the van packed up and delivering the furniture. Something exciting (for me) this week was the update of the fireplace. When we purchased the property the fireplace surround was left behind, the previous owners were split on their opinion of it. John asked us one day "you won't be keeping that thing in will you"? He was very surprised to hear the answer was yes - I just Love it! It needed a bit of TLC but I could definitely see it's potential! SS managed to fill in lots of the cracks for us, sand it down and ensure the shape was back to how it should be! These two images look like completely different rooms with the colours in these pics - they are definitely the same room and the wall is definitely grey (not blue). The hearth that the fireplace was sitting on has also seen a bit of TLC. It has been re-tiled and painted to bring it up to date, and for it to fit in with our colour scheme a little better. This room is really coming together now! I have lots of bits and pieces planned to go on top of the fireplace, I can't wait to get in there and start making the place feel all homely and lovely! BURNSYDE BEACH HOUSE WILL BE AVAILABLE TO HIRE FROM MARCH 1ST 2017! So this week we finally got round to updating our website and releasing our rates and exclusive offers. We have had lots of people emailing to find out more about the property; how many people can stay, will there be parking, how many nights can people stay, are dogs welcome....the list goes on! We love hearing from people that have been following our journey through the re-development and all these questions are helping us to build on the information we are already sharing. 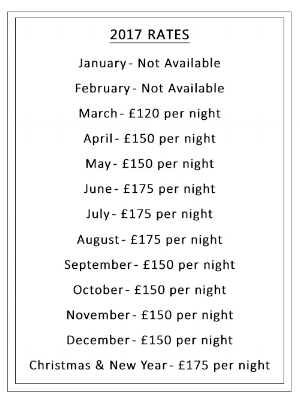 So you can now see on our rates page how much a little getaway to Burnsyde will cost, and for the month of March we are doing an introductory offer of £120 a night! A total steal if you are coming as a group! Yes, we ask that there is a minimum of two nights stay with each booking. Are dogs allowed and is there a charge? Well behaved dogs are more than welcome (maximum two per booking), we just ask that they do not go upstairs in the property and they are kept off the furniture as much as possible. There is a charge of £40 per booking if you are bringing your pups along. How many bedrooms are there and what’s their occupancy? We have three bedrooms in the property, there is one double and one twin bedroom on the ground floor and one double bedroom with en-suite upstairs in the loft bedroom. Each bedroom sleeps a maximum of two people. When can we see pictures of the property finished? In terms of the actual renovations the property is due to be complete by the 31st January , we will then be working on the interiors, furniture, soft furnishings etc. If all goes to plan we hope to share images of inside the property by the 10th February. We will of course keep you updated on our Facebook and Instagram pages. I am from the local area and would love to look round, is that possible without booking a stay? We will be holding an open house day towards the end of February which is when we will invite people to come along and take a look round the property. The invite will be on our Facebook page so make sure you follow us on there so you don’t miss it! How do I book a stay? Once we confirm your dates we will take a deposit of £100 and the remaining balance should be paid 4 weeks in advance of your reservation date. If your booking is less than 4 weeks away we ask that you pay the full cost at the time of booking. In the coming weeks will be adding a booking system to our website and that way you can book directly through the website. We will also be featured on Airbnb and Booking.com. Bit of a boring one for you today but hopefully all helpful information! 80 days in and the Beach House is coming along just lovely! We headed back to the north east this weekend to help out with tidying the place ready for the next round of work! The guys are keeping the place pretty tidy anyway, lots of paint pots and accessories lined up together. We were just having a hoover round and wiping down the newly fitted tiles, attempting to keep the dust away (hard task). It is all becoming very real that we will have a holiday rental up and running very soon! The weather wasn’t great this weekend and we arrived the day after the high tides hit Saltburn, the pictures from this were amazing but it’s sad to see the damage caused. We took a walk down to the beach and along to the valley gardens with little Dezza, there was lots of mess around but the council were working hard to get rid of it all! Once we got the pup home we headed to Burnsyde to see where we were up to. The guys have been super busy and as always SS has the team all in order to keep pushing this week. Both bathrooms and the kitchen now have their tiles in, the staircase is complete (with a stain that we like), skirting boards are being fitted and door frames are being put on. When I think about all the work that has been done it is crazy. There really was no stone left unturned when stripping this place back. The bungalow is a completely different place to what it was and each time we visit we are reminded of how hard everyone has worked to get it to this point. 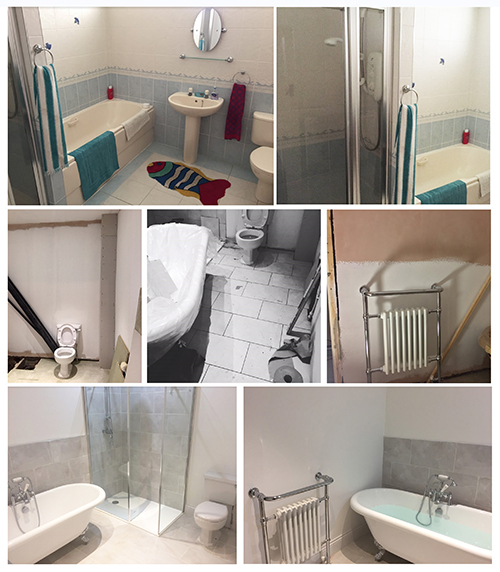 The family bathroom looks amazing, it used to be a very blue and dark room with a fitted bath and gloomy looking shower, now the place is bright and airy, a room you would want to relax in. The Roll top bath is in and with a couple of candles and a glass of wine I think it would make the perfect place to unwind after a day at the beach or a walk along the Cleveland way – I was tempted to try it out there and then! The picture definitely doesn't do the bathroom justice - and this is before we cleaned it! Another big change for us to see this week was the floor! We have chosen to have a laminate throughout downstairs and there are a couple of areas that have been started.....and one room finished!! Choosing a wood flooring is a difficult task, every single panel looks a completely different colour each time you blink! We spent a rather large number of hours to get this right! Hopefully you will agree we have chosen for the right colour - Light Oak. So this week is week 12 and it's going to be a busy one for the full team, nothing they can't handle though I am sure. And for me and Dale this week will consist of us (me) spending lot's of time searching for the final soft furnishings, I am unsure if there any websites I have not yet looked on, my browsing history would make me look like I have an addiction. Dale will be busy setting up booking platforms and secure payment methods.